Honest review of the Paddy Power Games website. 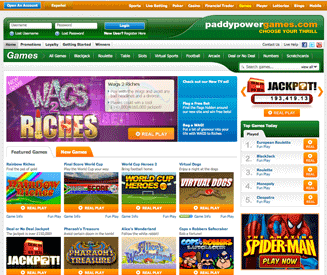 PaddyPower Games is an impressive all-round games site. When you combine lots of top quality games with an intuitive interface for searching through them, you know you’re on to a winner. Review of the games section. Paddy Power has one of the bigger arsenals of games (160+), spread across all the most popular categories. Whereas some sites just have one or two football games, PaddyPower has a whole section dedicated to them. As with most sites that offer a larger selection of games, the quality is going to vary. As long as you’re selective with your choices and aim to play the more popular games (the games at Paddy Power are ranked by popularity, which is handy), you shouldn’t waste too much time with the more basic or boring ones. For some reason they have decided to lump a bunch of casino games in this section. Lord know why, but because I like their service so much I’m going to forgive them. If you’re into casino stuff on the side you’re going to like that anyway. Paddy Power Games website review. A drop down list of all the games. A ranking of the top 10 games of the day by play count. The ability to sort games categories alphabetically and by popularity. Basically, PaddyPower is the best in terms of making it easy to sort and find the games you are looking for. In all honesty, all of the options do not make a huge difference, but it’s nice that they’ve put the effort in to improving the overall user experience in between actually playing the games. So good job Paddy Power. Paddy Power makes it as easy as possible to get money in and out of your account. The withdrawal times are also some of the fastest in the industry. In a nutshell, PaddyPower is great with banking. All the deposit options are there for you to choose from at Paddy Power Games, which is only to be expected from such a high-quality games site. Same again for withdrawals. Unfortunately Paddy Power do not currently offer the option of withdrawing (or depositing) via one of their shops in the street like Betfred Games and Ladbrokes Games do. No big deal though, they have every other possible banking option covered. Hopefully they will decide to introduce it in the future. We’ll see. The support at Paddy Power is so good that they happily display their response times for each contact method on their website. I haven’t seen that been done anywhere else. If you check out the "contact us" page at PaddyPower, you will see the rotating image highlighting the recent average response times for phone, email and livechat support. But don’t just take their word for it, I’m going to vouch for them as well. PaddyPower has one of (if not the) best support departments that I’ve ever had the pleasure of dealing with. Incredibly fast, effective and genuinely friendly - I’ve never had even the slightest concerns about my welfare with them. 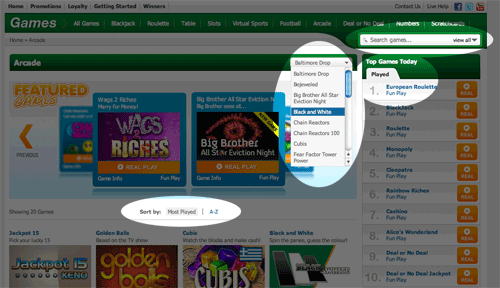 PaddyPower do not currently offer a bonus specifically for new depositors in the games section, which is a shame. (I know, I was surpsirsed to find that out as well). I’ll update this page when/if I hear of any changes.